All year, the goal for the Jayhawks has been simple: survive the first round and get to Kansas City for the NCAA Regionals. In a clash of super programs on Sunday afternoon in Tulsa, KU punched its ticket to play second-weekend tournament basketball. 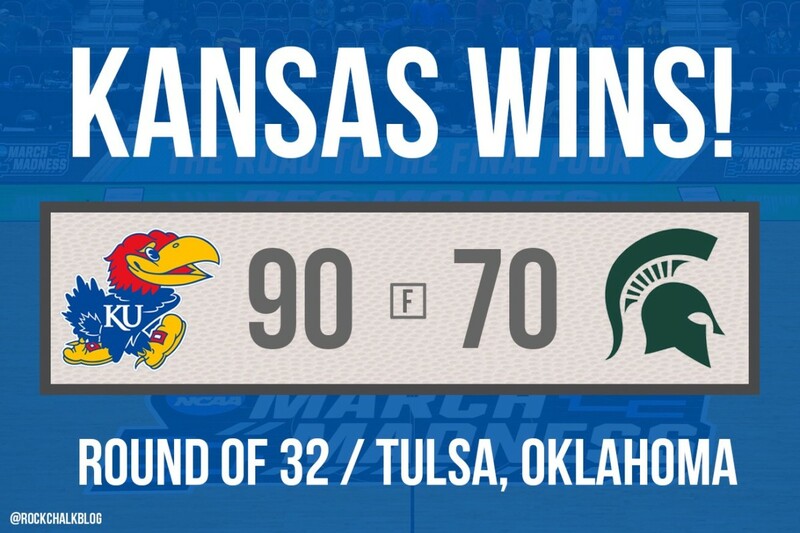 Top-seeded Kansas beat No. 9 Michigan State, 90-70, behind a late run that turned a nail-biter into a decisive victory. As they’ve done so many times this year, the Jayhawks’ star trio keyed a game-defining run to bring home a victory. Josh Jackson, who chose Kansas over Michigan State in April, was the best player on a floor full of star athletes. He overcame a slow start to score a game-high 23 points, going 9-for-16 from the floor. His extra gear lifted the Jayhawks in their game-sealing run, using an NBA-style, step back three and a dagger-inducing dunk at the end. After an even first 15 minutes, the Jayhawks went on a 13-2 run to grab control of the first half. However, six quick points for Michigan State, including three free throws when Lagerald Vick fouled Miles Bridges with two seconds left, allowed the Spartans to close the gap. At halftime, KU led by five, 40-35. Michigan State never took the lead in the second half, though the Spartans cut the lead to one, 54-53, at the 12-minute mark. After that, though, the Jayhawks took over, scoring 33 points over the last 12 minutes of action. Jackson was the hero, scoring 13 points in that stretch. 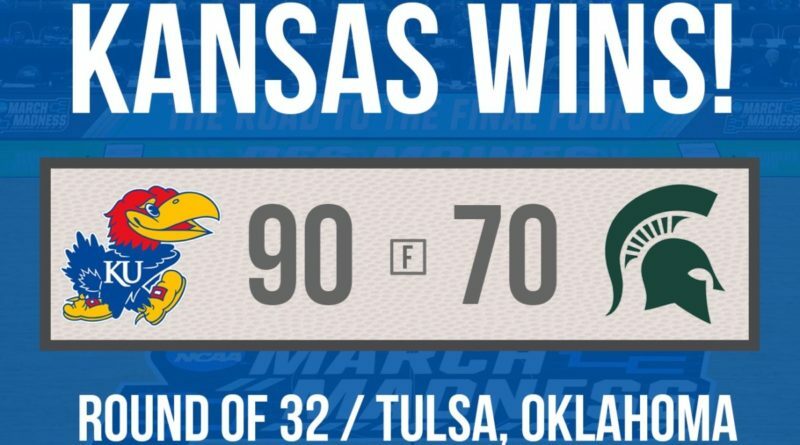 Overall, KU shot 53% from the game and 40% on threes, which are both great numbers considering Michigan State is one of the better guarding teams in the tournament. The key was getting Spartans forward Nick Ward into foul trouble. Michigan State simply wasn’t the same team without its best big man in the game. Another thing that sparked KU’s surge was Dwight Coleby. Landen Lucas’ presence was vital in the first half, but when he got into foul trouble after halftime, Carlton Bragg’s ineffectiveness allowed Michigan State to climb back into it. Bill Self turned to Coleby with about 12 minutes left, and the difference he made in the game was immense. In eight minutes, Coleby had three points, four rebounds, and a steal, and his presence altered several Spartans shots. He was the X-factor in the second half. Three Jayhawks scored at least 18 points: Jackson (23), Frank Mason (20), Devonte’ Graham (18). Mason passed Darnell Valentine for sixth place on the all-time Jayhawk scoring list early in the second half. He now has 1,838 career points, which puts him exactly 50 behind Sherron Collins for fifth. Up next for the Jayhawks: No. 4 Purdue on Thursday night in Sprint Center. The Boilermakers are the tallest team in the country, so KU will need all hands on deck in the frontcourt. 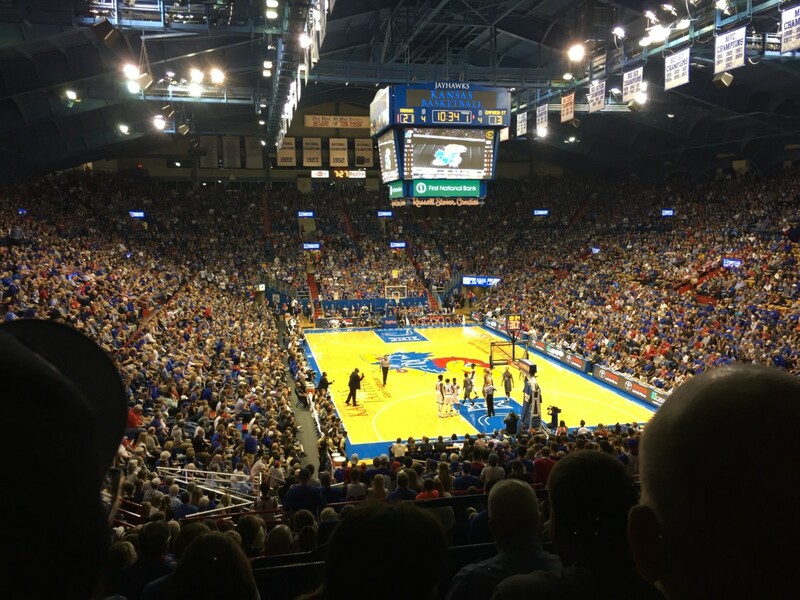 However, an enormously pro-Jayhawk crowd should provide a big boost. Josh Jackson: 23 points (9/16 FG), three rebounds, and two blocks. He was the best player on the floor, and considering how much this game meant to him, it was great to see him shake off a slow start and dominate. Frank Mason III: 20 points (6/16 FG, but 8/8 from the line) and five assists. He had his usual dose of “how the heck did he make that” driving layups. Devonte’ Graham: 18 points (7/10 FG, 4/6 from three), which came out of nowhere. He had nine points before KU’s game-sealing run, and that’s when he caught fire to make some killer threes. He also had four rebounds, four assists, and three steals. Svi Mykhailiuk: nine points (3/5 FG), while Lagerald Vick added seven (3/7 FG). Carlton Bragg: 0 points, one rebound, and three fouls. Woof. 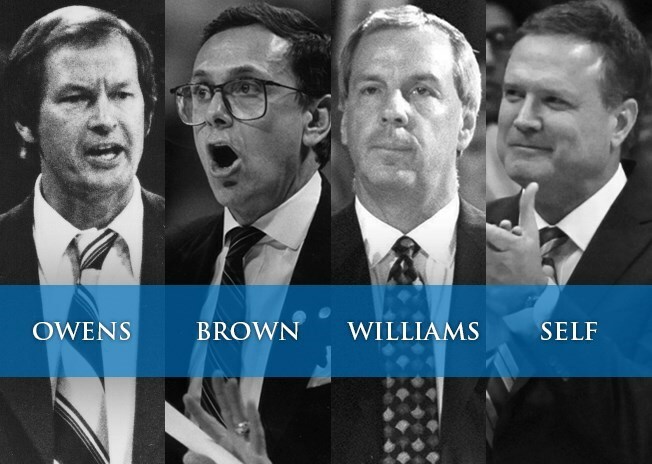 For Kansas, it’s the ninth time in Bill Self’s 14 years that the Jayhawks have advanced to the second weekend. They’ll draw Purdue on Thursday night. What we learned – Kansas at Arizona State: Whose fault was that?